Do you feel a sharp pain in your tooth whenever you bite down? Does the pain quickly disappear after releasing the pressure? Do temperature extremes cause you pain? These are questions that your dentist will ask you as he or she tries to determine whether or not you have a cracked tooth. A crack in a tooth is not always visible to the eye, and sometimes cracks don’t even show on x-rays. But an early diagnosis and treatment is critical if you want to prevent this problem from becoming more complicated and costly, or worst case scenario — you end up losing a tooth. Teeth can crack as a result of chewing or biting on hard objects, eating hard candies and ice, or an accidental hit to the mouth. Clenching and grinding your teeth, uneven chewing pressure or stress on a tooth, and exposing your teeth to hot and cold temperatures, like eating ice cream along with drinking hot coffee, can eventually lead to a cracked tooth. And if you have a tooth that has had root canal treatment, it can become more brittle and susceptible to cracking. Whenever you bite down on a tooth with a crack, the force causes the crack to shift or open slightly. This movement can irritate the pulp of your tooth, which is made up of blood vessels and nerves, creating pain along with sensitivity to hot and cold foods. If the irritation to the pulp tissue is ongoing, the pulp may become damaged and unable to repair itself. This usually results in an infection, which can spread to the surrounding bone and gum tissue, making treating your tooth more involved and costly. The size and the location of the crack will determine the treatment. A small crack around an old filling, for instance, may just involve replacing the filling. Although, if the repair encompasses a large portion of the tooth, you may need a full-coverage crown for more stability. If your dentist concludes that the pulp tissue is damaged, he or she will probably advise root canal treatment and a crown in order to save the tooth. But the American Association of Endodontists explains that a tooth with a vertical crack extending below the gum line cannot be saved, making an extraction your only option. 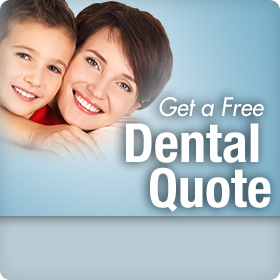 How Can a Dental Discount Plan Help? Expenses associated with a cracked tooth can add up quickly, especially if you need procedures more complicated than a filling. The fee for a root canal treatment, for example, is between $550 to $2000 and crowns range from $875 to $1400. And if the tooth needs to be built up before a crown is started, you can add another $150 to $250 to your total cost. Even with a traditional dental insurance plan, you may have a deductible to meet, and it’s likely you’ll exceed your yearly plan maximum and be left a substantial amount of the cost. However, if you opt for an affordable dental discount plan and have your cracked tooth treated by a dentist who participates in the plan, you can save up to 50% of the total charge. In addition, there are no deductibles, or yearly plan maximums to be concerned about. And all services are covered, including cosmetics. The cost of dental treatment necessary to save a tooth is always money well spent, but why spend more than you have to? Just click on the link to the right to access a Confident® dental discount plan through Careington®, find a participating dentist in your area, and start saving today.